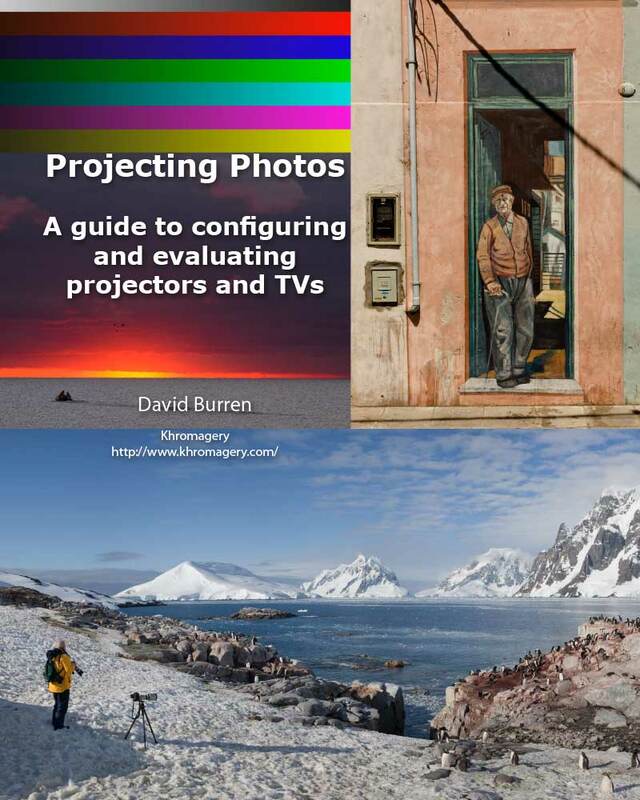 PDF e-book designed to help you select and configure projectors and TVs for the accurate display of photographs. e-book in PDF format (76 pages). Published in 2012, this book is intended as a resource to assist anyone involved in configuring and even just choosing displays to be used for displaying photographs. Examples include photographic societies and camera clubs looking to project their members’ images for critique. There’s a lot of benefit in having the correct image being shown, avoiding the “Really, it doesn’t look like that at home!” symptom. Professional photographers looking to sell images to clients based on projected versions in the studio can also benefit. Sometimes a reasonable image can be produced by careful configuration of existing gear. Other times you may find that the gear just can’t do the job (examples can include projector models targeted at only movie and video game display) and you’ll need to find a suitable upgrade. Either way this book is designed to guide you through the process.